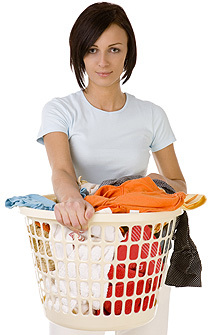 Is your clothes dryer fire safe and energy efficient? Dryer vent cleaning promotes proper air-flow, improves the efficiency of your clothes dryer and prevents dryer fires. 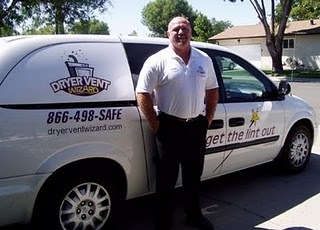 As your dryer exhaust vents become clogged with lint and other debris, drying time increases. As drying time increases and your dryer continues to labor the system becomes overheated as the hot air cannot escape through clogged vents. This increases energy consumption and will eventually lead to a fire. If you notice your dryer taking more than one cycle to dry a load of laundry then it is a good idea to have your dryer vent cleaned. Don’t be fooled by the idea that the dryer is old and wearing out; this is rarely, if ever, the cause of this type of problem. When air flow is restricted the moist heat cannot escape the dryer drum; therefore, it would make sense that the clothes would not dry. Some dryer vents are short and straight and can easily be cleaned by the homeowner; others are quite long, depending on where your laundry room is located. Some dryers are vented through a stack on the roof; others are vented through an outside wall. By law, all dryers must be vented to the outdoors. Extra long dryer ducts that make several turns may require special tools and equipment to properly clean. A professional who specializes in dryer vent cleaning will have the tools needed to do the job. Professional dryer vent cleaning is recommended at least once a year to prevent fires, extend the life of your dryer and help save on energy costs. This said the fee for the service is well worth the savings it promotes in the long-run. Dryer Vent Wizard of Oakdale, CA provides dryer vent cleaning, dryer vent repair, dryer vent installation, dryer vent inspections and all dryer vent services for homes and businesses in Stanislaus County, Modesto, Oakdale, Riverbank, Waterford, Ceres, Turlock, Patterson, Grayson, Hughson, Newman, Salida, Keyes, San Joaquin County, Tracy, Stockton, Manteca, Lodi, Lathrup, Escalon, Ripon, and neighboring cities and communities.